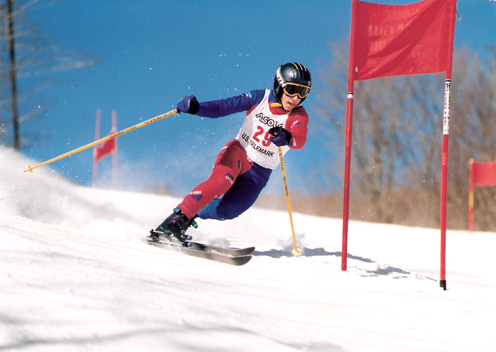 Today's Telemark Tuesday photograph takes us on a ski down memory lane to the year 1997. The skier rounding the gate while executing a lovely telemark turn is my son, Eddie Reed, who was 16 years old at the time. Although Eddie began his racing career as a nordic skier, his strength and penchant for going downhill very fast made him an awesome telemark racer. Eddie was fortunate to be ski racing in the day when Whiteface Mountain was the best spot in the country to prepare for competitive telemark skiing. Training home for numerous National Telemark Champions and U.S. Telemark Ski Team members, Whiteface Mountain and the New York Ski Education Foundation's headquarters were Eddie's second home in the winter. It was an awesome moment when, after a great deal of hard work, he became a member of the U.S. Telemark Ski Team. The positive effects of discipline, focus, sportsmanship, camaraderie and pride in achievement gleaned from those cold days on the mountain remain evident 13 years later.